Several times a year here, a group that is angry at the government for something it did or didn’t do will block all the major roads in a region until the government promises change. Though there have been many blockades since we arrived, this week we were actually stuck in a road blockade for the first time. In this case, the motorcycle taxi drivers (our primary way of getting around in Montero) were protesting a new government regulation that would have required: license plates for all motorcycles (about $50/vehicle), paying annual property tax on the motorcycle, and paying the back property tax on the motorcycle. On Monday (Feb. 13), we drove down to Santa Cruz in one of the Sisters’ trucks, with the nephew of Sister Clara as our driver. We had to work on some visa stuff (an ongoing process since September, they still have our passports!) in Santa Cruz and were just going down for a few hours. When we drove down at about 8:30 in the morning, we didn’t notice anything special along the road, it seemed like an ordinary day. After conducting our business and grabbing some lunch, we started to head back up the road to Montero. After going about ten minutes up the road from Santa Cruz to Montero (just past the airport on the map) we hit a line of stopped cars. We got out to see what was up, and heard about the blockade. Like I mentioned above, these are fairly frequent in Bolivia, and usually only last for a few hours, so we decided to go back to Santa Cruz for the afternoon. We went shopping for some building materials and went out to get ice cream. 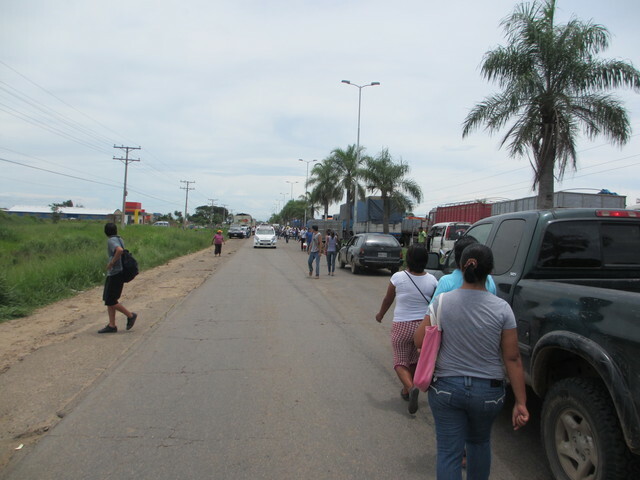 Around 6pm we were hoping that the blockade had lifted, so we went back up the road to Montero to see if it was any better. Unfortunately it wasn’t, but we were hopeful that it would be lifted any minute, so we decided to wait in the line there. After about an hour, the line started to move and we saw traffic coming from the other direction, so we were excited that it had been lifted. However, that turned out not to be the case. We only made it about a mile up the road before we stopped again. We later learned that this was because the people who had setup the blockade had moved it to a different spot along the road. After waiting an hour or so at this new spot, we gave up and decided to return to Santa Cruz. Thankfully, one of the Sisters we work with has a family member in Santa Cruz that agreed to put us up for the night. However, getting back to Santa Cruz wasn’t as easy as it should have been. We had a 4×4 vehicle, so it wasn’t too hard for us to cross the median into the lanes going the other direction (which should have been empty because all that traffic was stopped on the other side of the blockade). However, now these lanes were full of taxis and buses that had brought people up to the blockade, so that they could walk across. There were so many people trying to get across at this time of night (I’d estimate >5,000) that the taxis that dropped people off couldn’t leave again before more taxis arrived, so they got trapped in a huge traffic jam, and the people who came in later taxis ended up having to walk much further (almost a mile to the blockade). Here’s a short video I took of us in the traffic jam going *away* from the blockade. We finally made it out of the traffic, got some dinner, and went to bed around 11pm. The next day (my birthday) we got up and hung around Santa Cruz for a while, had a nice breakfast, and did some errands. There still didn’t seem to be any hope of the blockade lifting (the paper reported negotiations the night before had gone south), so we decided that we would try to walk through it. 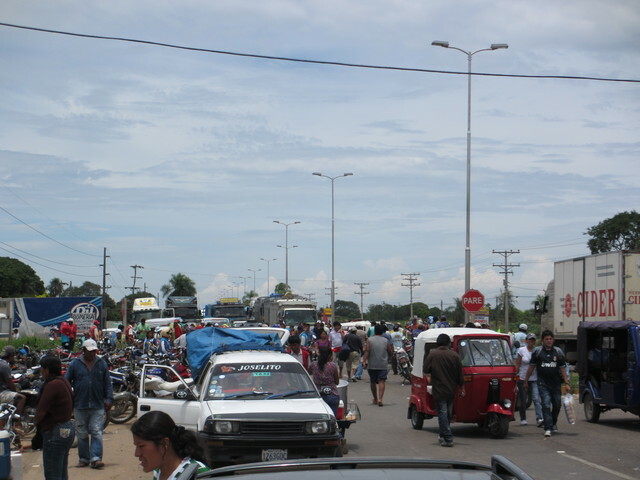 We took a taxi up to the blockade and thankfully the terrible traffic from the previous night had cleared out. We only had to walk about a quarter mile to actually get to the blockade, which wasn’t too bad. When we got there, it was just a lot of guys standing around across the road. We looked down and tried not to make eye contact with them. We followed three Bolivian women through, trying to look like we were with them…hoping that would help them ignore the two (very out of place) white people walking through. That nearly backfired on us when one of those three started saying stuff to one of the guys as we were leaving the blockade, but nothing came of it, and we made it through safely. Since it was just a lot of guys standing around, you might wonder why didn’t the police just come out and clear them out? Word was they paid off the police to stay out of it. The actual blockade is where all the people are standing, just in front of where all the trucks are stopped. Political note: The reason blockades are successful is because of Bolivia’s lack of infrastructure. There is literally only one paved road going north out of Santa Cruz. This is Santa Cruz’s connection to the rest of the region and is hugely vital economically. Due to the heavy rains this week no other unpaved route was viable. It’s sad that this is the only way that people feel they can have their voices heard by the government. The 3-day road block affected hundreds of thousands of people and caused businesses to lose thousands of dollars. The whole country gets hurt when roads are blockaded. Very interesting! I also think it is interesting that this “major” road looks so narrow to me! I was definitely picturing the equivalent to a US interstate before I saw the photos. It is a 4-lane divided highway, but there’s no shoulder and the divider is only a few feet across. The pictures are really only showing the one side of the highway, in the bottom picture, the truck that says “CIDER” on the side, is in the left-most lane on the other side. Also, you can see the four trucks next to each other just beyond the blockade, I think 3 of those are on the road (the side coming towards the camera) and the fourth is on the shoulder. When/how did Javier make it back? Ahhh, we kinda lost poor Javier in our story. He was the nephew driver, we last saw him when we left his Aunt’s house. He was going to spend the day doing things with her, and drive the truck back when the blockade lifted. However, when we talked to the Sisters today, they said he ended up leaving the truck at his Aunt’s and walking through the blockade. Unfortunately, some of our groceries are in the truck…but I expect they’ll be able to bring the truck back in a day or two. Thanks for sharing this. Be safe out there! I have a friend who experienced a blockade in Kenya after an election in 2008. There, they were not only blocking the roads, but also setting some of the vehicles on fire. It can be scary stuff. Blessings!